Tompkins County benefits from being a regional tourism destination. A combination of amenities like the colleges and wineries, scenic gorges and and convenient location have made it a popular weekend getaway from the big cities of the Northeast and Mid-Atlantic, as well as some of the major Great Lakes cities. In the past ten years, the hospitality and tourism sector of the economy has grown over 20 percent, adding several hundred jobs even after seasonality is taken into account. An additional benefit is that the room taxes are used to fund arts and culture grants, community festivals and part of TCAD, the economic development agency. Representative of that growth has been the growth in the local hotel industry. Around 2014 or so, one of the big questions was, how many hotel rooms is too many? The Marriott was in the works, the Hilton was in an earlier stage, two hotels were planned on the Route 13 corridor, and the Hotel Ithaca had its plans. For practical purposes, it was a good question. However, the situation evolved over time. As is often the case, the hotels opened later than anticipated. The 159-room Marriott finished late last fall, the 76-room Holiday Inn Express was completed a couple months earlier, the Hotel Ithaca went with an expansion that actually reduced the available number of rooms by ten and opened earlier this year, and one of the suburban hotels, a 37-room independent boutique hotel, was cancelled. They all came onto the market later than expected. and the number of rooms added was less than originally planned. All the while, the economy continued to grow at a consistent 1.5-2% annual pace, Cornell continued to add students and the population slowly grew. Had all the hotels opened at once with their original plans, the impact might have been a big problem. But the reality was that the Hotel Ithaca’s impact was modest, and the HIE’s and Marriott’s supply is being absorbed (though the market does need over a year to fully adjust to a 12.8% growth in supply). For the record, Airbnb and similar services have their impacts as well, but the county estimates it’s the equivalent of roughly 40-60 hotel rooms. With the market still adjusting to the influx, it’s probably a good thing that the Canopy Hilton isn’t opening until Spring 2019, well after a new equilibrium is achieved. However, it’s been a long road to get to this point. First, a brief history of the site. In recent years, the Hilton site was a mix of private and municipal parking. From 1916-1993, the Strand Theater occupied the site. The Carey Building was designed to match the Egyptian Revival motif of the theater, but unlike the Carey, the theater closed in the late 1970s, attempted and failed at a reopening as a community theater, and after being vacant for over a decade, the building was deemed too far gone to save, leveled by the wrecking ball during the deep recession of the 1990s. The first mention of a hotel on the 300 Block of East State/MLK Jr. was back in December 2012. 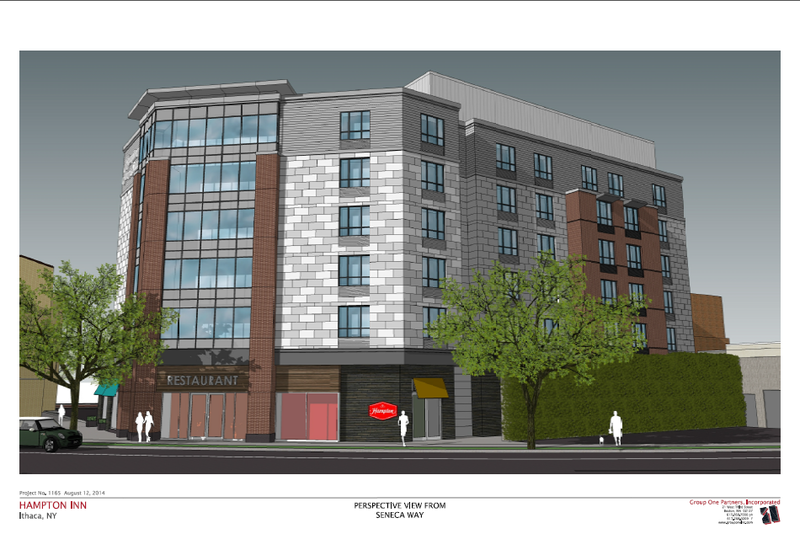 Lighthouse Hotels LLC (Neil Patel) proposed a six-story, $16 million Hampton Inn on the site (v1). The 92-room hotel, designed by Jagat Sharma, would have resulted in the demolition of the Carey Building – recall this was before the Carey overbuild. However, Patel violated an important rule when it comes to development – unless you have made previous arrangements, don’t propose something for someone else’s property. The proposed Carey demo caught Frost Travis by surprise, and he and parking lot owner Joe Daley were less than amused. Nor were Planning Board members, who were fond of the Carey and not fond of the surface parking proposed with the hotel. The project went nowhere, and a major reworking was required. Negotiations with the city and neighbors were needed to acquire the necessary land, and the IURA and Common Council agreed to have the IURA represent the city on divestiture discussions. Fast forward 18 months to June 2014. Having hired on Whitham Planning and Design to handle the review process on behalf of Lighthouse Hotels, a new six-story sketch plan was presented (v2). 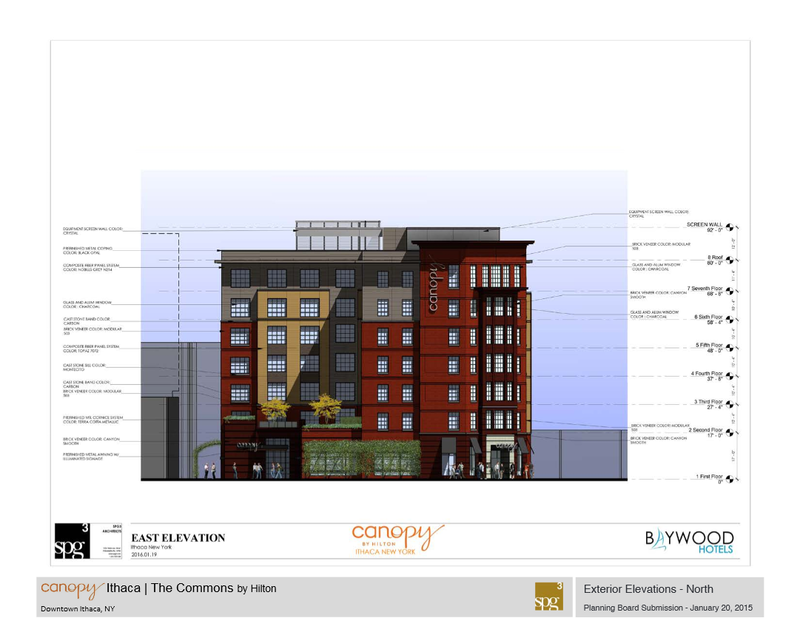 This plan did not impact the Carey (by then undergoing review for the overbuild), and opted for a more modern design by Boston’s Group One Partners Inc., which specializes in urban hotel plans. By August 2014, a site plan review request was formally submitted, along with a modestly revised design (v3) – at the time, the six-story, 120-room hotel was pegged at $11.5 million. These early plans also called for a 2,000 SF retail or restaurant space on the ground level. By this time, Patel was a vice president at Baywood Hotels, a national hotel developer and management firm with over $1 billion in assets, and regional offices in suburban Rochester. The firm is so large, they have 26 hotels currently under development from Miami to Minnesota, but that might be conservative. 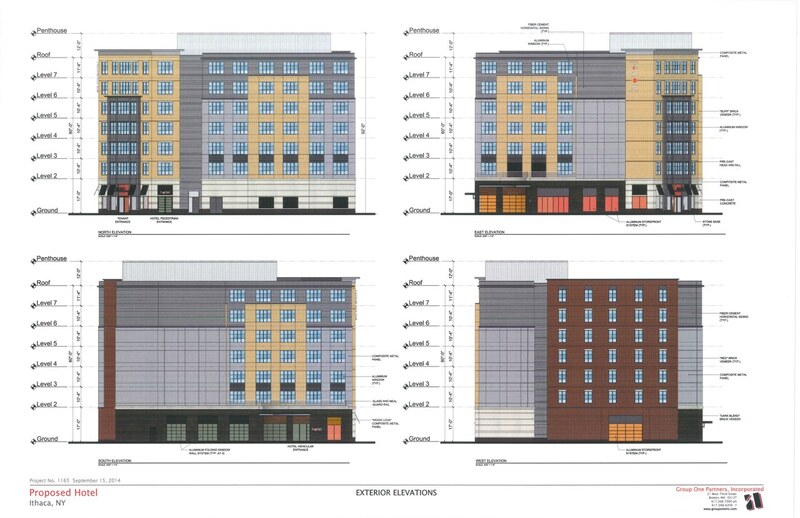 Their planned downtown Syracuse Hampton Inn isn’t even listed, and the render for the Hilton Canopy Ithaca is out of date. Technically the phrasing is “Canopy by Hilton Ithaca”. It will be either Canopy or Canopy Hilton on the blog. The Canopy brand was launched in October 2014 to be the lifestyle brand geared towards younger leisure travelers. Of the eleven locations announced at launch, Ithaca was the only one not in a major city, and is arguably the only one still not planned for a major city. A month earlier, the newest 74,475 SF, 123-room, 7-story design rolled out (v4), with industrial warehouse-style aluminum windows, buff and “dark blend” brick veneer, stone base with precast concrete accents, and grey fiber cement and metal panels carried over from the previous design. The second floor would open up onto a terrace overlooking the front of the hotel, and the first floor had folding windows that could open the lobby area to the outdoors on nice days. By January 2015, the designed had been tweaked some more (V7 in the link, but the changes were pretty minor from V5-V7, facade materials and window treatments), the cost had risen to $19 million, and LeChase Construction was signed on to be the general contractor. In fact, Patel and Frost Travis has even worked out a clever plan to share construction equipment as both their buildings were underway. However, Patel and Baywood’s schedule fell behind Travis’s, so the plan never panned out. During this time, the project had applied for the IDA’s enhanced tax abatement, and underwent Common Council review after its public hearing in November 2014. While concerns were raised about not paying a living wage to all staff, the council decided the pros outweighed the cons and endorsed the project. Baywood planned to hire 33 to 47 staff, of whom 11-20 would make living wage (multiple sources with different figures). Room rates were expected to be $160/night. According to the 2015 application, the project’s combined hard and soft costs were $24.17 million, and the property tax abatement (the enhanced 10-year abatement) was $3,528,081. Another $980,928 was waived in sales taxes, and $45,000 from the mortgage tax, for a total tax abatement of $4.55 million. About $3.28 million in new taxes will be generated on top of the existing taxes on the land, along with room taxes and payroll taxes. During the public hearing, attendees went after the project for union labor, living wage and sustainable energy concerns, but the project was still approved by the IDA. They might have switched over to heat pumps, I’ll need to check into that. After the original project was approved in March 2015, the city voted to approve the sale of its land in April 2015, and the IDA approved a tax abatement in July 2015, the Hilton plan sat dormant for a while before undergoing a major redesign in January 2016 courtesy of Philadelphia’s spg3 Architects, now Bergmann Associates. It turned out the project had struggled to obtain financing due to rapidly rising construction costs, and underwent some “value engineering”. The general shape was kept the same, but the exterior materials were swapped, the building increased in size to 77,800 SF, the room total was brought up to 131, and the restaurant space was omitted, among other changes. This required re-approval by the city. The much longer comparison is here. The very last version of the project, V9 in February 2016, added inset panels in the northwest wall, and some cast stone was added to the base. The second floor roof deck was tweaked, a cornice element was added to the mechanical screen, and the trellis and driveway pavers were revised. The final form is faced with a few different shades of red brick veneer, topaz yellow and grey fiber cement panels, metal coping and cast stone trim. Floor height (ceiling of seventh floor) is 80 feet, while structural height (top of mechanical penthouse) is 92 feet. It’s not really a big impact on the downtown skyline, but it broadens the city’s shoulders a bit. After approval and IDA approval, things were slow to start. 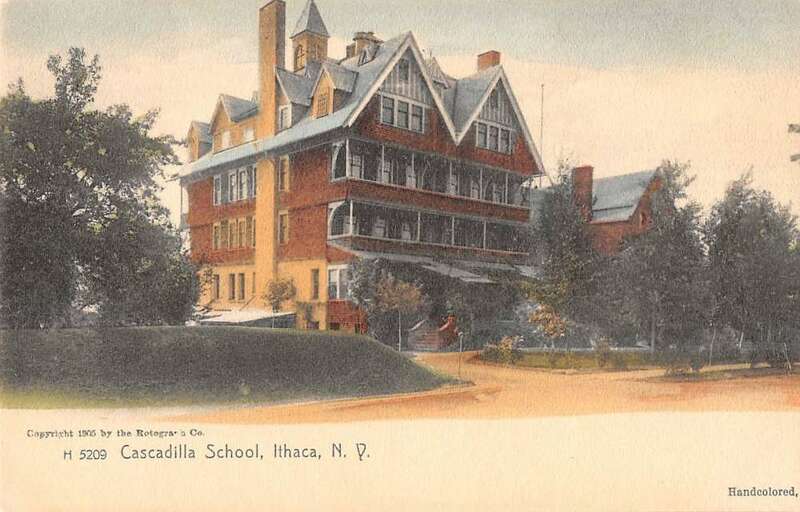 Ithaca Downtown Associates LLC, representing the Patel family, was reorganized slightly to include other family members in the ownership, and afterward it purchased the properties for the hotel project in August 2916. $1.8 million went to the IURA for the parking lots at 320-324 East State Street, and $2.05 million to local landlord Joe Daley for the parking lots on the former Strand property at 310-312 East State Street. A $19.5 million construction loan from ESL Federal Credit Union (formerly Eastman Saving and Loan of Rochester) was received at the end of September 2016, but things were stalled for a while, and only now is the project on its way to a Spring 2019 opening, two and a half years later than initially planned. William H. Lane Inc. of Binghamton will be the general contractor. Long story, but at least someone wrote it up. Goes to show that property development can be a very complicated process. It looks like foundation excavation is currently underway – I had head many of the underground utility work was taken care of when the Carey was under construction next door. A plausible schedule has foundation work done by the end of winter, with structural steel framing underway during the spring and summer. Work continues on the new Tompkins Trust office tower in downtown Ithaca. The official topping-out, which means that the building has reached maximum structural height and framing is complete, was earlier this month. U.S. Gypsum sheathing can be seen on the east and south (front) sides, with fireproofing and interior stud walls clearly visible from street level. You can see some of the HVAC rough-ins on the lower floors. Meanwhile, on the north (rear) and west faces, the exterior facade has been bricked and paneled with aluminum metal, tan brick, dark grey brick, stone sills and aluminum window fittings. It’s a little surprising the sunshades are already up, since exterior details typically don’t come until later in the construction process – and it’s clearly not that far along, given the rough openings still present at ground level. The base will be finished with brick and granite. To be honest, I was concerned the back side would end up looking cheap, but it seems to be coming up nicely, but I’m holding off on final judgement until I see how the rear stairwell turns out. About the biggest change at this point is that the $31.3 million, 110,000 SF building may not be finished and completed occupied until mid-May 2018, two months later than initially planned. As described in the Voice summary, City Centre is digging deep. “Unlike the Hilton Canopy, City Centre will have a basement, or more specifically, a 71-space underground garage. The plan here is to use a mat foundation, which is a shallow foundation that doesn’t make use of piles or pile drivers. The company that did the geotechnical report for City Centre reported that a 26-inch mat foundation was feasible based on soil borings, and would be less expensive than a deep pile foundation like the one being used for the Canopy. So basically, excavate some trenches, build some big footers with a lot of rebar, and pour a 26″ concrete slab. Support columns will transfer the weight of the building through the garage and into the slab beneath. On a hunch while exploring Newman’s project-specific websites, I was able to find City Centre’s website. Morgan Communities of suburban Rochester will be the site manager, and is apparently also hosting the webpages; they’re live, but you can’t find City Centre on their search page yet. Units will range from a 508 SF studio unit, to a 2 bed/2 bath 1319 SF units with coveted Commons views. Apartment features include quartz countertops, electric stove, microwave, dishwasher, and stainless steel appliances. On-site amenities include fitness center, “E-Lounge”, bike storage, controlled access, optional garage space rentals, electric car charging stations and furnished apartments if requested. Dogs and cats will be allowed. Rents have yet to be listed, though they’re expected to be on the medium-high side (premium, not luxury). The webpage touts Summer 2019 occupancy, which seems to be a split of the Spring 2019 and November 2019 dates used previously. Inquiries are being taken to CityCentreIthaca@morgancommunities.com, if you know someone planning that far ahead. On another note, while poking around the geotechnical report, it turns out that early plans called for the entirety of the first floor to be occupied by a 19,900 SF “Target Express“, the smaller urban cousin to the Target general merchandise retail chain. This had to have been early on, because the parking had a much different configuration than the formal site plan, with an East State Street entrance vs. the South Aurora entrance in all the later revisions. With only nine stores as of mid-2016, Target is pretty selective about new Target Express locations. Why it was removed from City Centre is unclear. The tagline used on the Voice was “Press Bay Alley is as quirky as Ithacans like to think they are.” But it’s not just a quip. Press Bay Alley and its upcoming sibling, Press Bay Court, are unusual developments. Completed in 2014, spaces at the micro-retail plaza on West Green Street range from a 160 SF barbershop to a 2,000 SF confectioner. Other tenants include a novelty store, a cafe, a circus school, an herb/spice shop, a high-tech workshop and electric bikes. Around Halloween, it becomes Harry Potter’s Diagon Alley. It’s an eclectic development by any regard. Micro-retail is a growing retail trend that offers a unique niche product or a very limited selection of convenience products and services. A shop like Amuse or a service like Ithaca Generator may not need a large space to achieve its business goals, and can save on rental expenses with a limited footprint, compensated by being in a high pedestrian-traffic areas, in this case a couple blocks from The Commons. Similar examples include Memphis’s Edge Alley and Denver’s Dairy Block. Granted, Ithaca is smaller than Memphis or Denver, but the underlying dynamics of active-use blocks and high foot traffic are present nevertheless, and businessmen John Guttridge and David Kuckuk of Urban Core LLC identified a potential market for the concept in Ithaca. Seeing an opportunity in the former printing press and garages of the shrinking Ithaca Journal, Urban Core, who had recently bought the Journal Building, decided to move forward with a renovation and see if they could make the concept work locally. The risk seems to have paid off, as Press Bay Alley is fully occupied. With that under their belt, and with renovations to 121 West State partially completed (waiting on fit-out for a potential restaurant tenant), Urban Core has committed to a second phase of the project at 108-114 West Green Street. Currently vacant, 108-110 West Green housed Hausner’s Garage and a Chevy car dealership in the 1920s (see photo below), a DeSoto-Plymouth dealer in the 1940s, Ithaca Photo from at least the 1950s through the late 2000s, and from 2012-2017, McNeil Music. In the rear where D.P. Dough is (114), The Haunt nightclub called it home from 1969-1997 before moving across town. What Urban Core’s latest plans would do is expand that “experiential” micro-retail mix eastward towards the corner of Green and Cayuga Streets, the Commons and the downtown core. The parking lot in front of D. P. Dough would be converted into a plaza much like Press Bay Alley’s, and the first floor of 108-110 West Green would be renovated into 5-8 micro-retail units facing the new plaza (the Green Street entrances would be retained), with 320-2200 SF per unit. The second floor would be renovated into four below-market rate one-bedroom apartments with 510-660 SF of living space, and the exterior masonry would be cleaned and repaired. The hawk mural will be preserved. New signage, bike infrastructure, curbing, sidewalks and a parklet are included in the plans. The total square footage in phase two is about 9,000 SF. One of the more unusual quirks of Press Bay Court is part of the plaza would be convertible into an amphitheater/stage space for outdoor performances. So if some comedy improv group or local dance troupe wants to perform for an audience of several dozen, that’s an option. The next day, it might revert back to an outdoor seating space with movable furniture and display space for retail tenants. That weekend, it might host hungry or browsing festival goers spilling out from Press Bay Alley, which will be connected through the Press Bay Building. The space will be adaptable and multi-use, which will hopefully provide exposure for tenants. Later plans call for renovations to the 15,000 SF Ithaca Journal (Market Bay) Building for an indoor arcade and second-floor office tenants, and a 2,400 SF new restaurant tenant in 121 West State Street, in the basement below The Watershed coffee lounge and bar. Ultimately, the goal is to build a thriving, synergistic environment where the businesses create a natural flow of customers and clients between the various shops and services offered on the block, and the outdoor space’s active uses contribute to and help sustain small local enterprises. The project cost is estimated at about $900,000, most of which went into property acquisition. Financing comes from a Tompkins Trust Company loan, cash/equity, and a $200,000 low-interest loan from the Ithaca Urban Renewal Agency. One of the tenant spaces is being offered in the Downtown Ithaca Alliance’s “Race for Space II” competition, with the specific unit to be selected by the winner. At the moment, not much appears to be happening. The “cut-out” lines are a clever advertisement for the future micro-retail storefronts, while the parking lot is a pop-up park for the time being. According to Press Bay Alley’s Facebook page, “Urban Core popped up a temporary installation to experiment with several design elements and gather public feedback.” Previous plans called for a spring opening, but with the Restore NY Grant under consideration, the project may not start until the Spring, in which case this entry saves the trouble of writing one next March. However, the later start date might force changes to Race for Space II, which asked for the selected tenant to be ready to move in by spring 2018, the same time construction was pushed back to in order to be eligible for Restore NY funds. Continuing yesterday’s theme, here’s another one of Collegetown’s development opportunities playing out, though perhaps it was less obvious as the Linden Avenue properties – coming soon to Ithaca, 60 units with 191 beds of student housing at 232-236 Dryden Road, just east of Collegetown’s core and part of the eastern transition to the Belle Sherman neighborhood. Once again, this is a case of Visum Development Group scouting potential opportunities at the right time and place to make something happen. Along with a large surface parking lot, the previous building on this site was a 30-unit apartment building and the former dormitory for the historic Cascadilla School, a private school with a 140-year history on the corner of Oak and Summit Avenues in Collegetown. The 4-story building once housed dorms, a dining hall and a gymnasium, but after its sale to private ownership after World War I, it was remodeled again and again, each seemingly more unsympathetic than the last. By the late 20th century, it was a grim, awkward-looking box, stripped of ornamentation and of its historic value. The previous owner, the proprietor of the Hillside Inn, had owned the property for several decades; Visum paid about triple the tax assessment ($7.65 million vs. $2.55 million) to buy the property in September. There are two buildings to be built, totaling 84,700 SF – 232 Dryden (The Lux South) and 236 Dryden (The Lux North). This allows for different plane grades, meaning they’re different elevations. That makes it easier to blend in with the neighbors, and creates less ambiguity with height limits, something that bedeviled Visum with its 201 College Avenue project. As with 210 Linden, zoning is CR-4 – four floors, 45 feet from average grade, no parking required with a city-approved transportation demand management plan (TDMP). Usually, that means free bus passes or Carshare registrations, ample bike storage, and explaining how students can easily commute to campus by walking. The project was proposed in March 2017 and approved by August. Overall, the changes were fairly modest. No zoning variances and little public opposition helped to create a smooth review process. The biggest change came during the design review process, and affected the Dryden Road facade – revised fenestration and the addition of shingle-style balconies. STREAM Collaborative’s intent is to give the south building a little more historical sensitivity, and the balconies are throwbacks to the Cascadilla dormitory’s long-gone shingle-style balconies. However, given that this building will date open in 2018 and not 1898, instead of wood shingle, the balconies will use Allura “Redwood” fiber cement shingle – wood pulp mixed with sand and cement, shaped for a wood-like appearance, but with the durability of concrete. Fiber cement is also more expensive to buy and install vs. materials like vinyl, which is why only more expensive or visible structures tend to use it. Other planned materials include Endicott manganese ironspot velour brick veneer, fiber cement panels with LP smart trim painted in Sherwin-Williams Pure White and Anonymous (that is the actual name), lap siding in SW Pure White and Marigold, granite grey stucco (real stucco, not DryVit), a metal canopy and Andersen windows. The loan, for $16,354,628, was granted by S&T Bank, a regional bank based in Pennsylvania that has no retail banking presence in Ithaca, but has served as the financier for several projects, including the Holiday Inn Express that recently opened on Elmira Road, and Visum’s just-opened 201 College Avenue project. A breakdown of the costs shows the total project cost is $22,780,334. There’s $13,020,010 in hard costs (materials/labor), $7.65 million for property acquisition, $475,000 in soft costs (architect/engineering/legal), $250,000 for the demolition, and the rest is for taxes during construction and interest reserve (interest on the construction loan during construction). $650,000 (5% of the hard cost) is set aside as contingency funds just in case the expenses clock in higher than expected. Despite the rather pretentious name and logo, it’s hard to argue the amenities don’t live up to the premise – according to the marketing website, tenants of The Lux and other Visum properties have access to a media lounge, study room, hot tub, sauna, full-service gym, game room and outdoor terrace. Tenants will have trash removal, stainless steel appliances, in-unit washer and dryer, and bike storage. I feel poor just typing this stuff out. Units are 1-5 bedrooms, with the smallest being 1 bed, 1 bath and 435 SF, and the largest being a 1693 SF, five-bedroom, five-bath. Rents will be $1200-$1300/month. Visum is running an offer that if all tenants on a lease (presumably a larger unit) can show they’re members of a registered student org, they get 10% off the first month and a $150 check will be given to their organization. Many larger Collegetown units are legacy properties among student groups (fraternity annexes, bandies, club and NCAA sports), passed down from year to year by members of the org. This may be a clever move to make next years’ renting a bit easier on Visum, whose CEO noted softening in the market this year. A trip to the site shows caisson (steel pipe) piles have already been laid for The Lux South, and demolition is ongoing of the old apartment building on the site of The Lux North. The pipes extend down to the solid shale bedrock 46 feet below grade, according to local engineering firm Elwyn & Palmer. A deep foundation by any measure. A benefit to building in Collegetown is that the ground is much more amenable to deep foundations than the weak, water-logged soils of the West End. Technically, 210 Linden Avenue has been stopped for the time being, but just for the sake of having it, here’s the project description post for future reference. One of the intents of the Collegetown Form Districts was to encourage redevelopment in portions of Collegetown that the city saw as less desirable – the really stereotypically poor-quality housing that Cornell just called out in its state of the university address. These properties are generally unsuitable for families since most of them were purpose-built boarding houses, often with haphazard additions and renovations over the years to make the bare minimum of city building and fire code. With a captive market in Cornell students, many landlords didn’t see the need for quality because the prevailing logic was that it decreased profitability. Only during the first luxury developments of the 1980s (Fane’s Collegetown Court in 1985, Mack Travis’s Eddygate in 1986) did that really start to change, and even then, many older landlords clung to the old ideas, hesitant to change from a time-tested if ethically questionable formula. Since then, it’s been something of a development see-saw; developers see greater profit potential, but typically they need to build big to ensure a good return on investment (balancing soft construction costs, hard construction costs, interest on construction loans and current/future taxes against the revenue from renters). A large project comes along and drives discontent from East Hill and Belle Sherman, who have long clashed with the different lifestyles of students, as well as a longstanding sense of wariness from the old-style landlords who would try to buy homes and turn them into student slums. The city places a moratorium, tweaks the zoning, process starts anew. From a municipal perspective, it’s always been a delicate balance between the substantial taxes generated from Collegetown, and quality of life issues (traffic, rowdiness). In general, the 2014 form-hybrid zoning, which removed some parking regulations and put the focus on Collegetown’s core, has had favorable outcomes; the only real debate has been 201 College Avenue, which was a rather unique situation. 210 Linden Avenue is a textbook example of a shared goal between city and developer – the 200 block of Linden has many properties in poor condition, and the city would like redevelopment mixed among the better-maintained older houses. With that in mind, zoning is generally CR-4 – 4 floors, and no parking required as long as a Transportation Demand Management (TDM) plan is received and approved by city staff. New buildings wouldn’t be large or oppressive since most buildings are 2.5-4 floors on this block, and with planning board input, high quality designs would enhance the walkable environment, build the tax base, and add some housing to reduce pressure on adjacent streets. Developers in turn would have more flexibility, and removing the parking rules really opens up the possibility for new builds on Linden’s small lots. Previously, 210 Linden was a rather ramshackle 12-bedroom apartment house. Visum Development Group (VDG), led by local businessman Todd Fox, saw a potential opportunity for a new build and established a purchase option with the then-owners, a pair of small local landlords. The redevelopment is not an especially large project, medium-sized by Collegetown standards. It is 14,400 SF with 9 units, all of which are 4-bedroom, 2-bath, for a total of 36 bedrooms. Each floor has two units, except for the partially-above grade basement, which has one unit and space for the bike room, trash room and mechanicals. The project will use electric air-source heat pumps, and be net-zero energy capable with the use of an off-site renewable energy source. 210 Linden was first proposed in November 2016. With basically no opposition, and a design that the planning board found perfectly appropriate, it sailed through the review process, and approval was granted in January 2017. In something of a rarity for city projects, no zoning variance was required. 210 Linden fits the maximum length, width and building lot coverage allowed under the Collegetown Area Form District’s CR-4 zoning, and comes in at or just under the 45-foot height maximum – the sites are sloped, and the 45′ height is defined as the average above grade plane. Exterior finishes includes stucco at basement level, a couple shades of grey fiber cement lap siding above, red doors, metal balconies and natural wood trim. There were virtually no design changes from beginning to end – the only noticeable change was that the doors were moved from the left side of the balcony/terrace to the right. 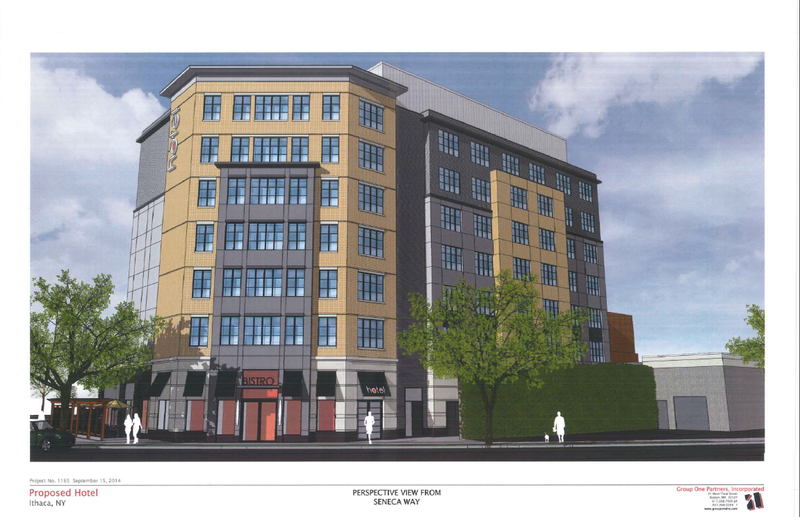 The project was a fraternal twin to another infill development Visum has planned, 126 College Avenue. One has to give credit to the architect, Noah Demarest of STREAM Collaborative, for being able to provide cost-efficient and well-received designs. A frequent partner of VDG, William H. Lane Inc. of Binghamton, is the general contractor. Right now, only the demolition and foundation excavation have been completed. Once the power lines have been buried out front by NYSEG, construction of the building can begin. The intent is to have the building completed in time for Cornell’s 2018-19 academic year, which starts in late August. Elmira Savings Bank gave VDG a $3.15 million construction loan in July to complete the project. As one might expect with new units less than two blocks from Collegetown’s core, the cost per room is not cheap. Advertisements online say $5,000/month, or $1,250 per month per bedroom. Units come with 9′ ceilings, air conditioning, internet/cable, stainless steel appliances, quartz countertops, washer/dryer in-unit, balconies, and a security system, among other bullet points and exclamation points. A fitness room and other luxury amenities will be accessible to tenants at another Visum project, 232-236 Dryden Road. With the twin duplexes on the corner of Aurora and Queen completed, local developer Stavros Stavropoulos and his local contractor Northeast Renovations Inc. have been able to turn their focus towards building out 107 South Albany Street. At this stage, the spread concrete footers, also called formwork or footings, have been finished. 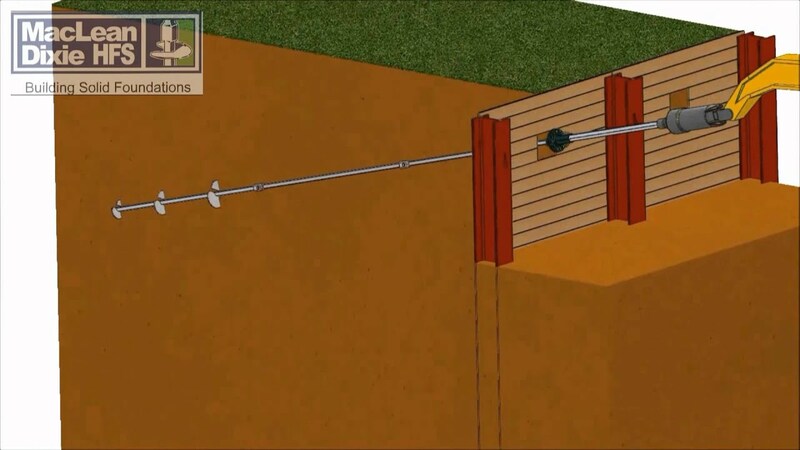 As in this case, footers are usually of concrete with steel rebar reinforcement that has been poured into an excavated trench and confined by wood forms. 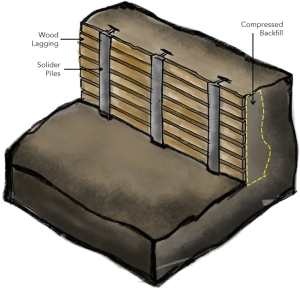 The purpose of footings is to support the foundation and prevent settling. The portion of rebar sticking out of the footers will be bent and wired into the foundation’s horizontal rebar, tying the two components together. I’m not sure if they simply filled in the basement of the old house or if they tore the walls out before bringing in clean fill and digging trenches for the new footers (I’d guess the latter for simplicity’s sake). It looks like the outer footings for the ground-level common space (entry, bike storage, meter room) are at a slightly lower grade than the rest of the structure, so there might be two separate sections that comprise foundation, with one at a slightly higher elevation than the other. The next steps involve a rebar grid being ssembled and tied per specifications, elevated a few inches from the ground by plastic rebar chairs that allow concrete to get underneath the steel rods. The concrete will be poured over the rebar, and as long as the bars stay in place, the new pour is left to dry into a solid, reinforced slab foundation upon which the building frame can be built. The building itself will have a wood-frame, so when it starts to rise, it should move at a pretty fast pace. A summary of the project can be found here.